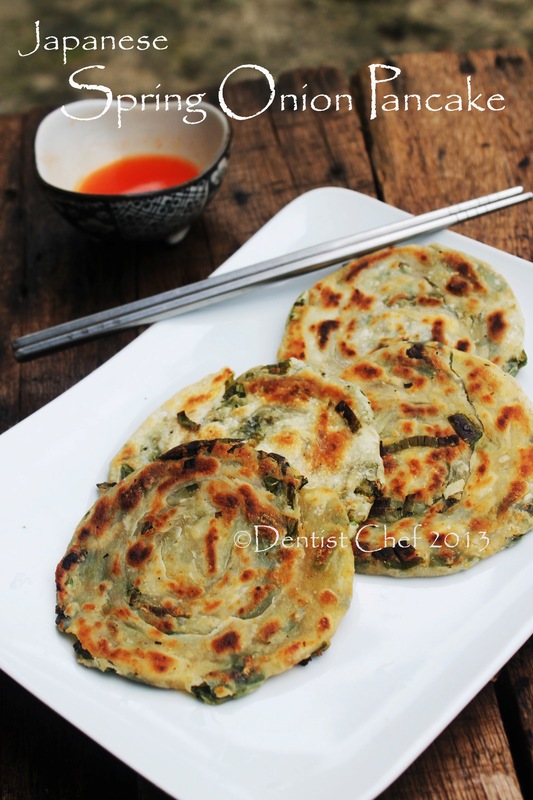 Japanese spring onion pancake or sometimes called chinese scallion pancake is one of my favourite savoury pancake. The secret recipe making a crispy and delicious spring onion pancake is made a papaer thin dough and applied a generous amount of oil before folded and rplled the pancake. 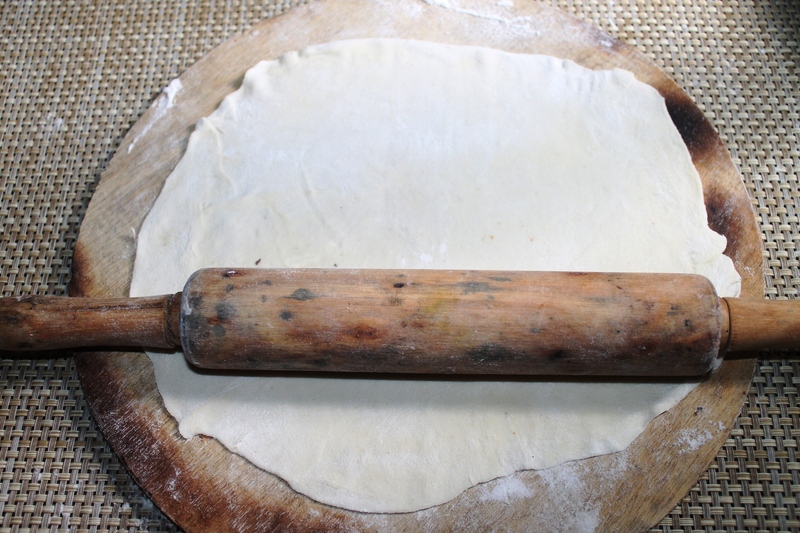 Oil keeps each layer of rolled dough separated and thus made is crisp up when the pancake is heated in the pan. 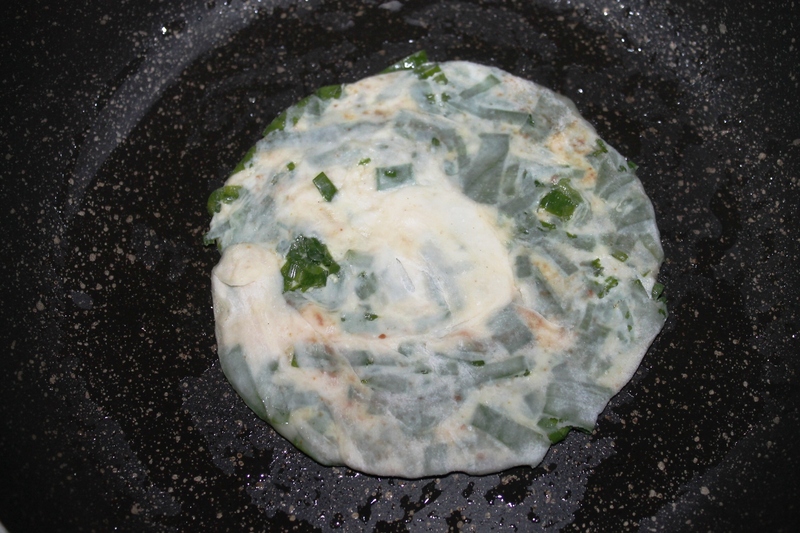 My sister like to add the whole part (including the white part) of the spring onion, but i prefer using only the green because the white part gor more moisture and it’s made the layered pancake dought not crisp up. 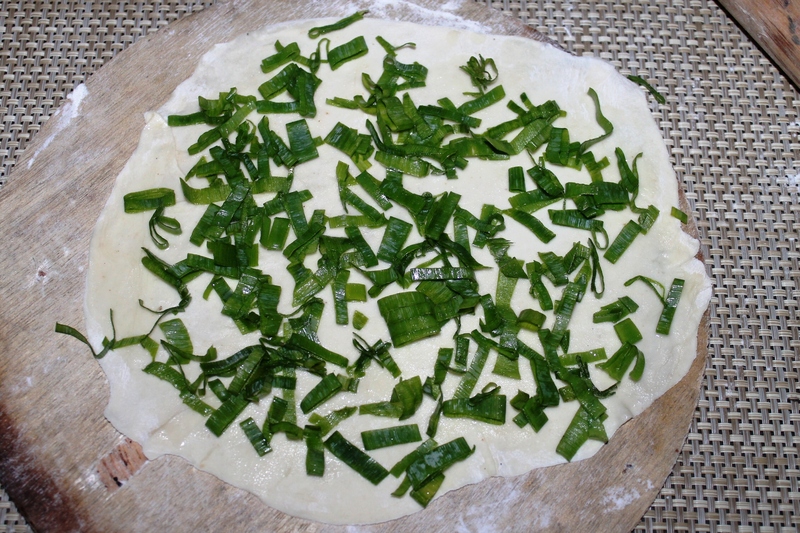 Spring onion/Scallion/Leek/Green onion pancake confused me from the very beginning when i’m googling it. Mostly everybody describe the dish as a chinese cuizine. The NHK WORLD show “Your Japanese Kitchen” call the dish Japanese Leek Pancakes, and i’ve been eaten the same dish in japanese restaurant. Anyway, who the hell cares about the dish come from, but i’m preety sure that this appetizer taste really great. 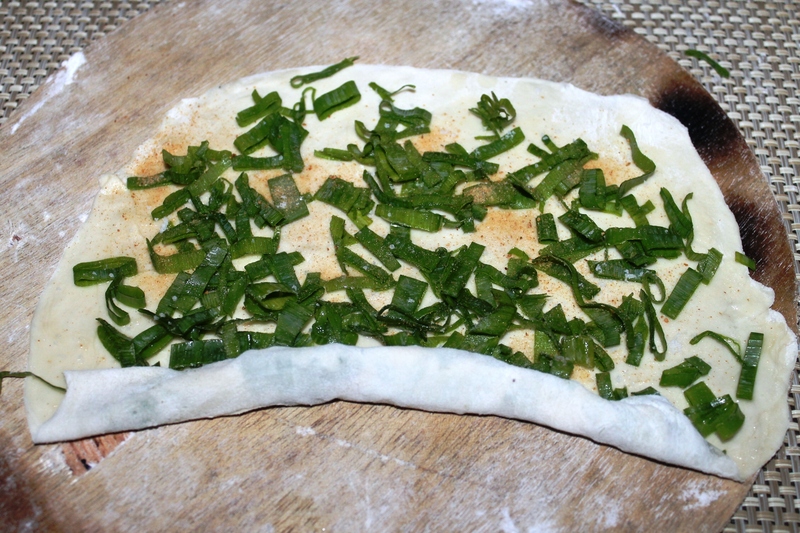 Savory, crispy and distinct umami flavour derived from browned spring onion and wheat dough. Dip in your favourite sauce and it’s will be great evenmore. 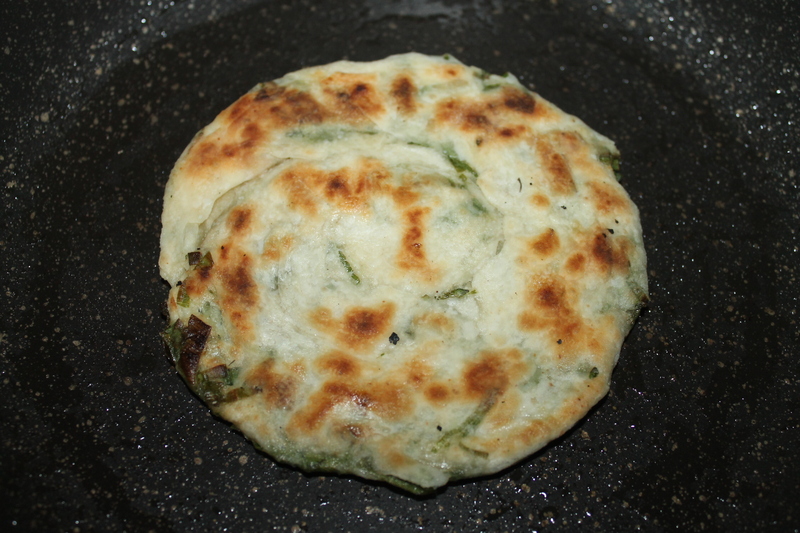 Scallion pancake is one of popular assorted streetfood in China. Even here in Indonesia, I’ve never seen any chinese restaurant serve this as an dimsum, but my causin said that they did there. 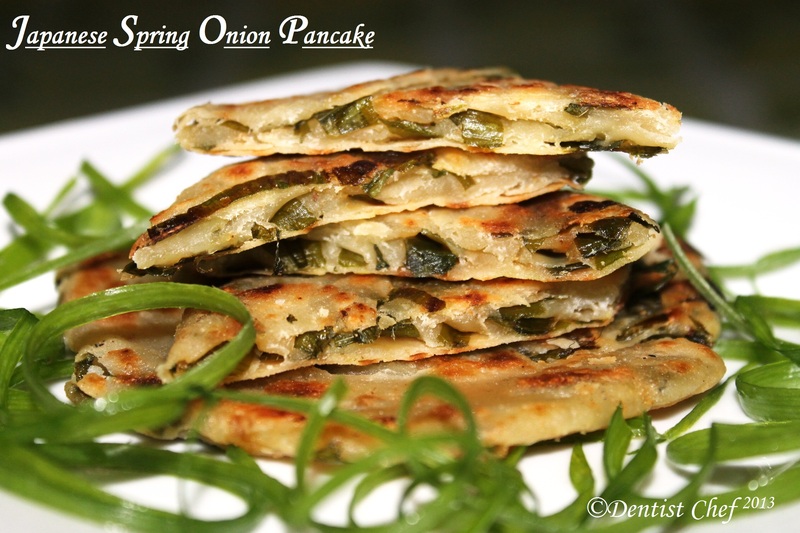 spring onion pancake serve as an appitizer before the real meal. This dish could tickle the taste buds papila to let your crazily starving for more delicated food. But i acctually assume this dish similiar to Indonesian bakwan or deep fried cabbage cake. 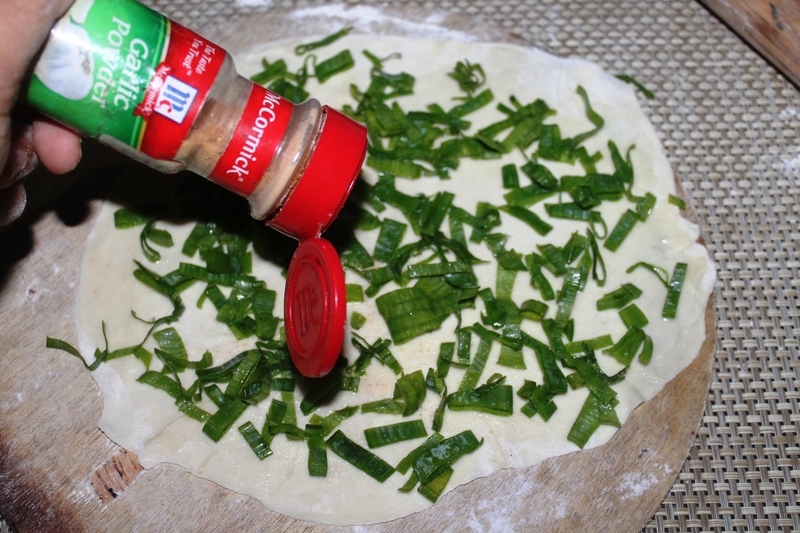 You can add any spice within the pancake, but i prefer a simple garlic powder for it. 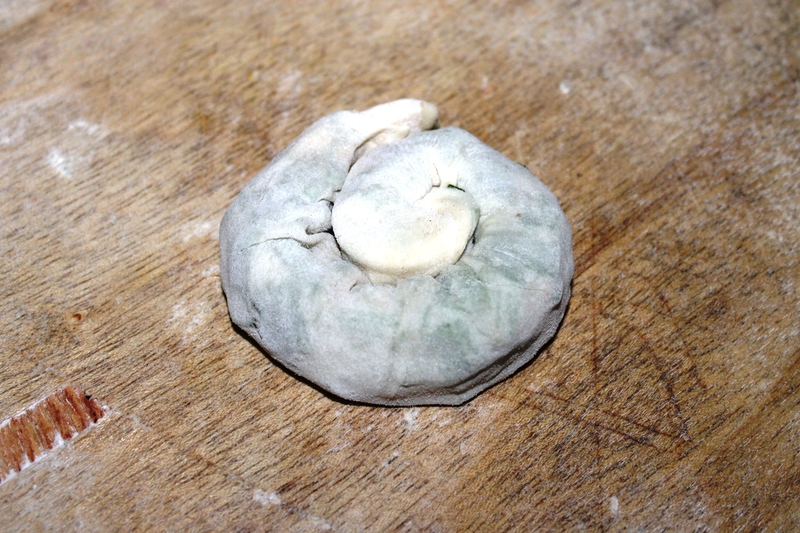 Mix flour with water until it forms a smooth dough. Knead by doubling the dough over and pressing it down repeatedly, until the dough is even more smooth and very elastic. 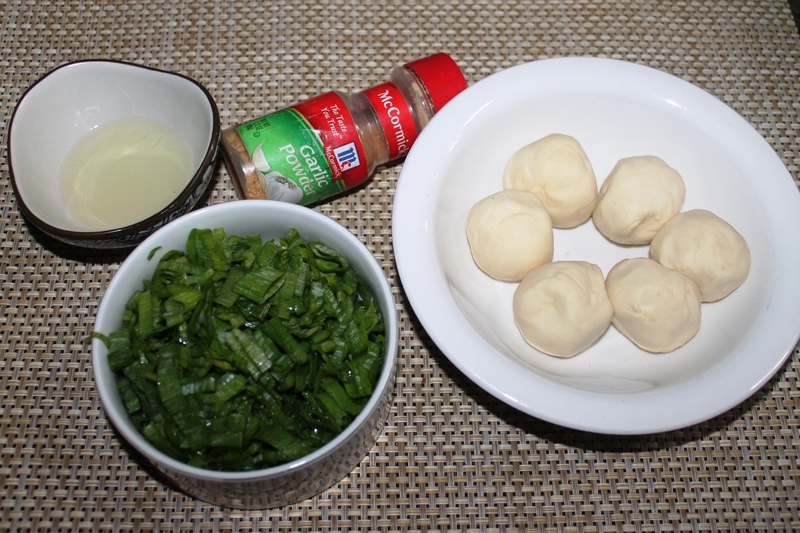 Coat this ball of dough lightly with 1/2 tbsp oil and put it back in the bowl. Cover the bowl with a damp cloth and let the dough rest for about 30 minutes. Cut the dough into 6 equal parts. 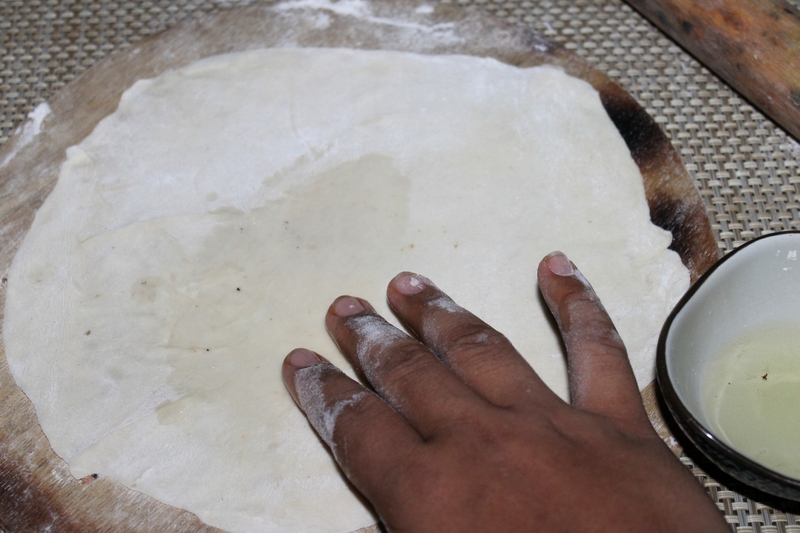 Lightly spread a little flour in your working area. 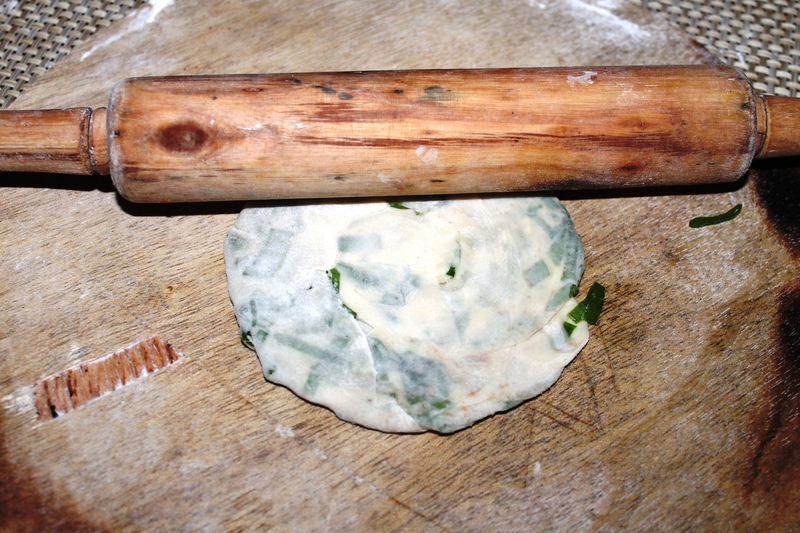 Roll out one part of the dough until it is a thin round shape. Roll out the snake shaped dough bundle again into a snail shaped pancake. Heat a heavy skillet or sauté pan over medium-high heat, and oil it with a drizzle of oil. When the oil shimmers, pick up the pancake dough and lay it gently in the pan. It should sizzle, but not burn. Cook for 2 minutes on one side. Flip the pancake over with a spatula and cook for an additional 2 minutes on the other side, or until golden brown. Cut the pancake into wedges with a pair of kitchen scissors, and serve immediately with soy sauce or another dipping sauce. This entry was posted in Appetizer, Japanese food, Resep Chinese Food, Resep Dimsum (Dumpling), Resep Sarapan (BREAKFAST), Resep Sayuran (VEGGIES), Resep Vegetarian, Step by Step and tagged chinese pancake recipe, chinese spring onion pancake, how make japanese pring onion pancake, how make pring onion pancake, japanese pancake recipe, leek ancake, leek pancake recipe, pancake ala jepang, pancake asin mudah resep, resep panccake asin enak, savory pancake recipe, scallion pancake recipe step by step instruction, spring onion pancake, step by step japanese pancake green onion. Bookmark the permalink. u should give it a shot…. this site is very nice, thank you. Savory pancake is more delicious with leek. 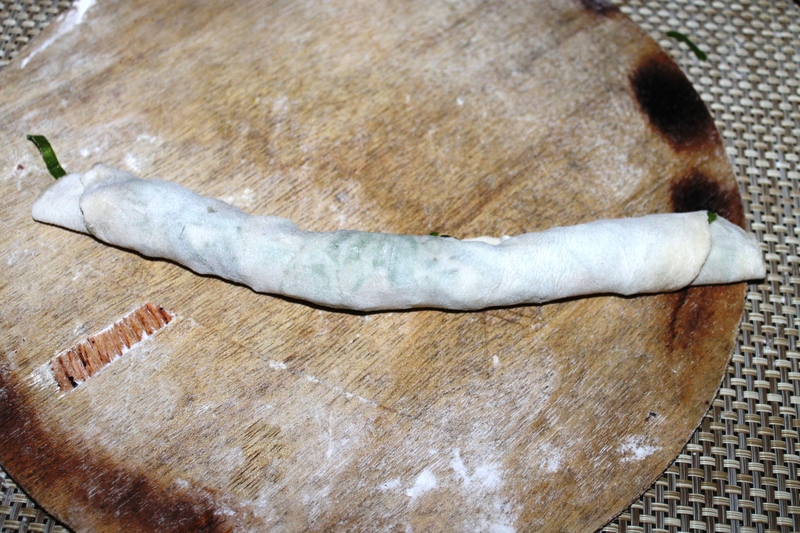 klo versi chinese emang dijadiin batter mbak, tp klo japanese pake dough….. I make these pancakes with mushrooms and bacon, try it, they are yummy! This is a Chinese dish! Not Japanese! di bali jajanan dikit banget pariasinya, jadi msti mencoba buat menu baru biar gak bosen makan yang itu-itu melelu. kapan2 aku mau buat yang kayak gini, bahan-bahannya juga simpel banget. 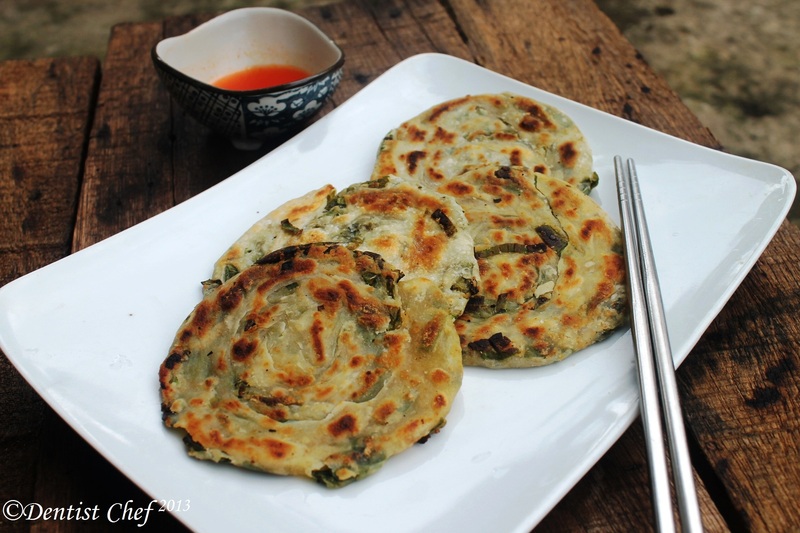 The Chinese Scallion Pancake is comfort food made in millions of Northern Chinese kitchens everyday. Every child saw the hands of their mom or grandma rolling these out. To see it here described as Japanese ( by the way, never seen this dish in Japan) stunned me. One would never see pancakes in Dim Sum because Dim Sum is the epitome of Southern Chinese Tea culture, never practiced in the North. Chinese dishes are intricate concoctions steeped in history and entwined with its geography. The pancake is as Japanese as the sushi is Chinese.